I spy Bud Light, Canada Dry, Newcastle, and a neck collar that I'm pretty sure is MacTarnahan's. OK, let's omit the Bud Light. But Newcastle is a nice find, I see it now. Is the Mac's neck the one right in the foreground? Just to the right of the Optimator bottle is what I think is Mac's. Is that a Bridgeport on the left under the clear bottle? Harry, it doesn't look like how I remember the back of a Bridgeport label, but they have changed the packaging lately, so maybe it is. Now I wonder if I see a Sierra Nevada Celebration in the top right corner, just above the "OR" of a Mirror Pond label. 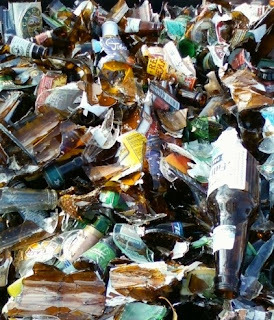 When I lived in Portland I collected my empty bottles (for homebrewing) from recycling bins. Far more than anything else I saw Widmer bottles followed by Deschutes. I didn't see too many Bud Lights.